PHOTO BY KEVIN FULLER Parcel 5: the former bustling retail center is waiting for development. 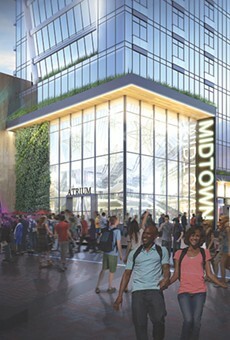 PHOTO PROVIDED Conceptual illustration of the proposed performing arts center on Parcel 5, fronting on Main Street. Architects are now working on more concrete designs. When retailing was at its peak in downtown Rochester, much of Midtown Plaza occupied what is known as Parcel 5. 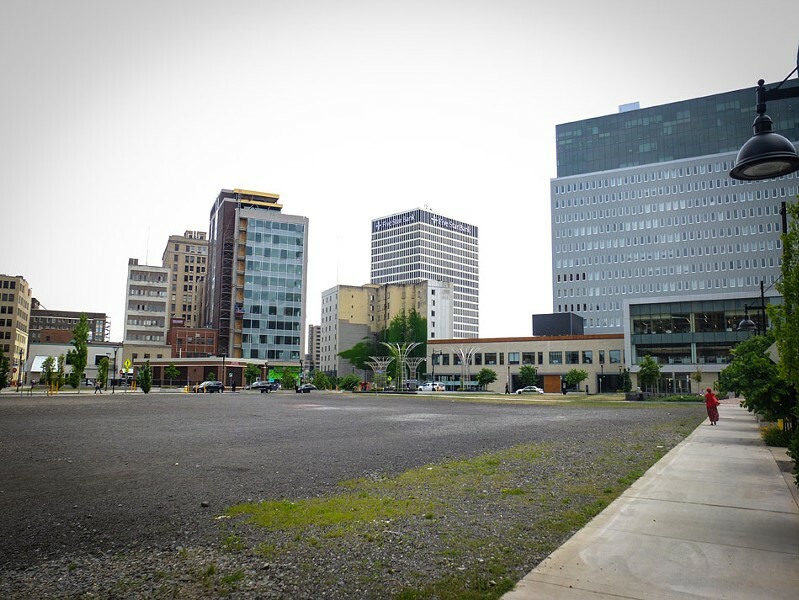 Right now, though, Parcel 5 – arguably downtown's most important development site – is a vast vacant lot, hosting occasional outdoor events and waiting for the future. And that future has become the focus of a serious urban planning debate and election issue. Illustrative of the debate: the Jazz Festival's big closing-night concert earlier this month. "I've got 15,000 people on Parcel 5," the festival's John Nugent said as he whizzed up nearby on his scooter. Clearly, he'd like to be able to use Parcel 5 for future festivals. And, he noted, developer Andy Gallina's proposal for a residential-commercial building would leave part of Parcel 5 open for events like his. The Warren administration doesn't envision Gallina's building or events like Nugent's on Parcel 5, though. If designs and financing are fleshed out satisfactorily, late this year – maybe in December – the city will prepare to sell Parcel 5 to RBTL and Morgan Communities. And early in 2018, there'll be groundbreaking for a large new theater – the Golisano Performing Arts Center – and a new apartment development. Architects and engineers for both developments are firming up plans. Morgan, one of the largest residential developers in the region, would presumably have no problem building the apartments. And with a $25 million pledge from billionaire Tom Golisano, RBTL's CEO Arnie Rothschild says he's confident his organization will raise the rest of the $75 to $85 million it needs. Rothschild says RBTL is already quietly raising other private donations and seeking state money, and he says a fundraising team "will be rolled out in the next week or two" to move into an "aggressive fundraising stage." Warren administration spokesperson James Smith said last week that he'd be "very surprised" if both RBTL and Morgan don't get their projects built. There's one additional step, though: Sale of any city land requires approval by seven of the nine City Council members. And getting seven votes isn't at all a sure thing. Asked last week whether she would vote for the project, Council member Molly Clifford didn't say she wouldn't, but she said she couldn't support it unless she was "certain about the amount of funding, that it was real and not subject to change." A project this large has many unknowns, she said, and many times some of those unknowns don't show up until the project is under way. "It's not just the money," said Council member Jackie Ortiz. "That's a concern, but I have yet to see serious support for it in the community. Mostly the people who come to Council meetings are speaking strongly against it. The group involved with the project speak in favor of it, but we're not seeing that from the community." Council member Carolee Conklin also said she's concerned about more than the theater's financing. Like many critics of Warren's Parcel 5 decision, Conklin is worried about the last-minute embrace of RBTL-Morgan's proposal instead of Gallina's. 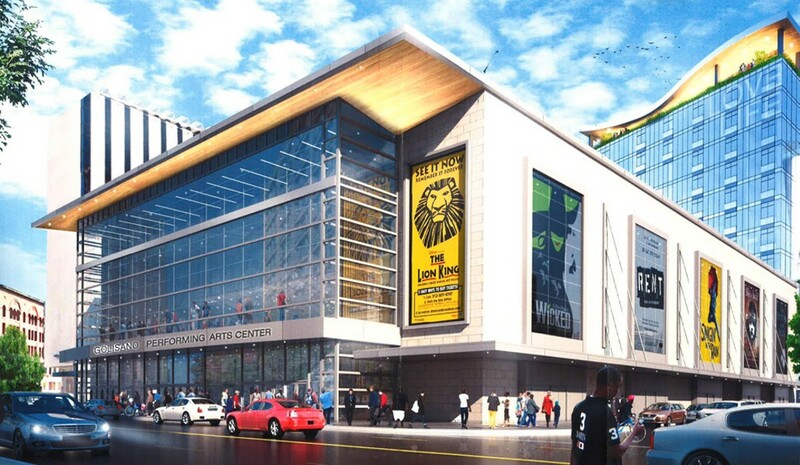 And, Conklin said: "I think that's not the place for a performing arts center. It's too large a footprint." "The long-term viability of the city," Conklin said, "depends on revenue" – tax revenue. Parcel 5, Conklin said, is one of downtown's prime locations, and putting an arts center on it would make it tax exempt. "Why not just let it sit there for a couple of years?" she said. "We really don't need a rush to judgment." Council member Matt Haag echoed Conklin's concerns. "I'm not convinced it is the best use of the site," he said in an email on Saturday, "from a tax revenue perspective, a community impact perspective, and a 'vibrancy' perspective." Haag said he's also concerned about the impact a new theater would have on the Auditorium Theatre, which RBTL owns, and on other local performance venues. And he wonders whether competition for venues could undercut RBTL's operations, requiring the public to subsidize it as it now does the Rhinos' stadium and the Blue Cross Arena. All of them could change their minds, of course. But at the moment, supporters of the RBTL-Morgan proposal have some work to do – if Council votes on the issue this year. If the vote doesn't happen until next year, though, it's hard to tell what might happen. Conklin and Haag are leaving Council at the end of the year, and Ortiz is running for re-election. That could change the balance on Council. 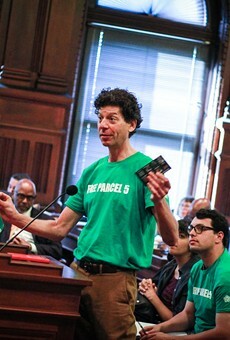 Parcel 5 was already becoming an issue in the Democratic primary campaign for mayor. Both of Warren's opponents in that race, Jim Sheppard and Rachel Barnhart, have criticized her for the Parcel 5 decision. Last week, Sheppard accused Warren of playing politics with the parcel, choosing a plan no one had heard about until her selection was announced. "We still don't know what this project is, how it will be funded, or what the impact on the city will be," Sheppard said. In a press conference last week, Sheppard noted that with the sudden decision to choose RBTL-Morgan over Gallina, Warren gave the public no time to comment on the new proposal before she approved it. The public hasn't been silent since then, though. Opponents of the performing arts center, including some representatives of the arts community, have spoken at City Council meetings, as have supporters of preserving the entire parcel for green space and for uses such as concerts and pop-up retail. And with the decision likely heading to City Council in late fall, those comments will likely continue.